Here's a delicious meal that you can whip up in less than 45 minutes and you may even have most of the ingredients in your refrigerator or pantry! It was inspired by Put an Egg On It, by Lara Ferroni, a book that I found by chance while shopping recently. The photo of this egg dish on the cover had me drooling! My version of the recipe (you can find the original recipe here), starts with cooked capellini pasta, which is mixed together with some cream (feel free to substitute fat-free or light cream), grated Sartori Parmesan cheese, chopped fresh parsley and salt and pepper to taste. This will form the 'nest'. Getting that perfectly cooked, soft and slightly runny egg was the hardest part and it took a couple of attempts to get it right. All ovens are different so times may vary for you. The best test is to lightly touch the top of the egg with your finger when you see the egg white has turned white. If the yolk still feels slightly 'jiggly' inside then it's done. Remember, it will keep cooking after you remove it from the oven. If your eggs turn out too well done, you can always whip up a little extra cream sauce and drizzle it over the top as a dressing. I decided that I needed a salad to make the meal complete, so I lined the plate with a spinach and arugula blend of organic greens before topping it with the pasta/egg nest. This was so good that my husband ate all of the 'tests' and asked for me to make it for dinner the next night too. A truly delicious meal for brunch, lunch or dinner! Preheat the oven to 425 degrees F and lightly butter ramekins and place them on a baking sheet. In a large bowl, mix together the cream, 1/2 cup of grated cheese, chopped parsley, salt and pepper. Set aside. Cook the pasta according to the package directions until al dente and drain, reserving a small ladle-full of the pasta cooking water. Place the cooked pasta into the cream mixture and swirl with tongs to coat well. Add a little of the pasta water, if necessary. Let the pasta remain in the sauce for a few minutes. Remove about one-fourth of the pasta and and place it in one of the ramekins, swirling as you lay it down. With the tongs, or your fingers, spread the pasta to the outside leaving an indentation in the middle for the egg. Repeat filling the rest of the ramekins. If you still have some cream in the bowl, pour it over each of the pasta nests, otherwise, add a teaspoon or so of cream to the top off each nest. 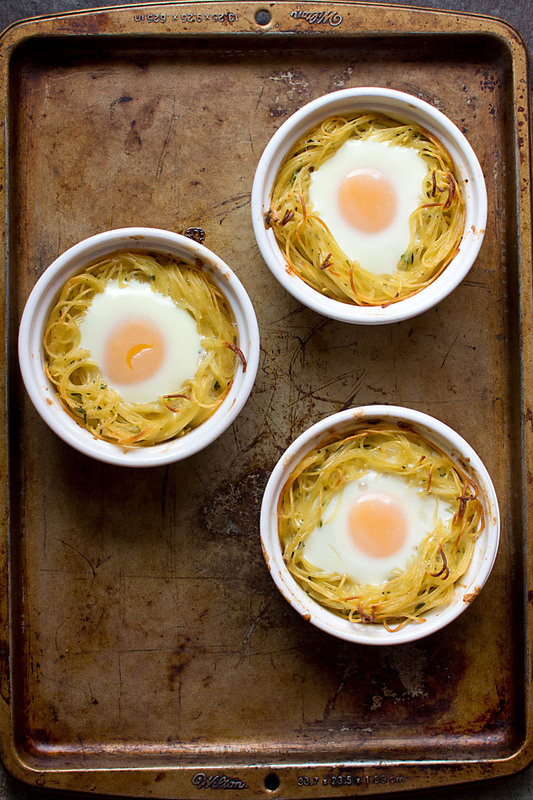 Let the nests cool for 5 minutes to firm up, then run a knife around the outside of the ramekin and gently remove it. Place on a bed of greens for serving. Garnish with another grind or two of fresh pepper and serve. Delicious! What a great idea! 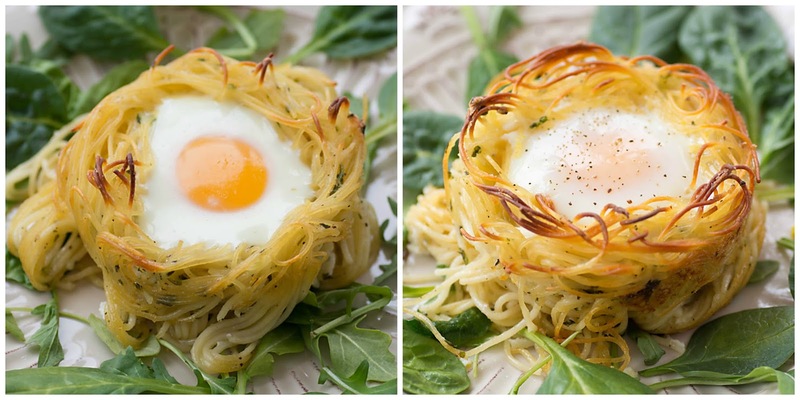 Those noodle nests look fantastic, Susan. That runny egg yolk in the last picture is just irresistible. Oh gosh, those do look yummy! Where else can you get that much protein for so little and taste so good, other than in an egg? Your soft cooked egg is perfect, what a great photo. So true, Marigene. A full, delicious meal for so little $! Thank you! Oh how I love this recipe. If you cooked some bacon on the side, you'd have pasta a la carbonara deconstructed. Thanks for posting. That would be good - never thought of bacon :) Thank you, Linda! Yum! We eat a lot of eggs. I am happy eggs are off the unhealthy list as well. Thanks for sharing. Hugs! Sometimes I even enjoy a fried egg sandwich for dinner ;) Thank you, Bonnie! Not today. I needed something I could prepare in advance to enjoy our baby to the fullest:) Maybe next time! Thank you, Monique! I know you love eggs, Larry ;) Hope you try it some time! Thank you. This dish is gorgeous and I can understand why your husband gobbled it up. It would be gorgeous for a fancy brunch. I eat an egg every day - soft boiled. I love it! This recipe sounds good and it looks good too. It would make a good brunch for a bit of a spur-of-the-moment invitation after church. I must look at the other recipes in that egg challenge. I love a soft poached eggs on toast in the morning too! Thank you, H! Oh Susan, I love eggs and what a way to showcase them, this makes such a fantastic meal. Serving this with salad was perfect, I can see why your husband wanted these the next night for dinner. a great idea Susan, so chic and tasty ! Have a good week my lovely grandma, a warm hug ! The presentation is pretty cool! I love eggs, always have. Me too! Thank you, Vee! Thank you, Nicole. I really appreciate your comment! I love everything about this post and the delicious egg recipe, Susan! And yes, I am one of those who shares the feeling that you have that it's so great that eggs are now considered more positive and less negative for us after all. I adore eggs and go through withdrawal if I can't get my morning eggs! 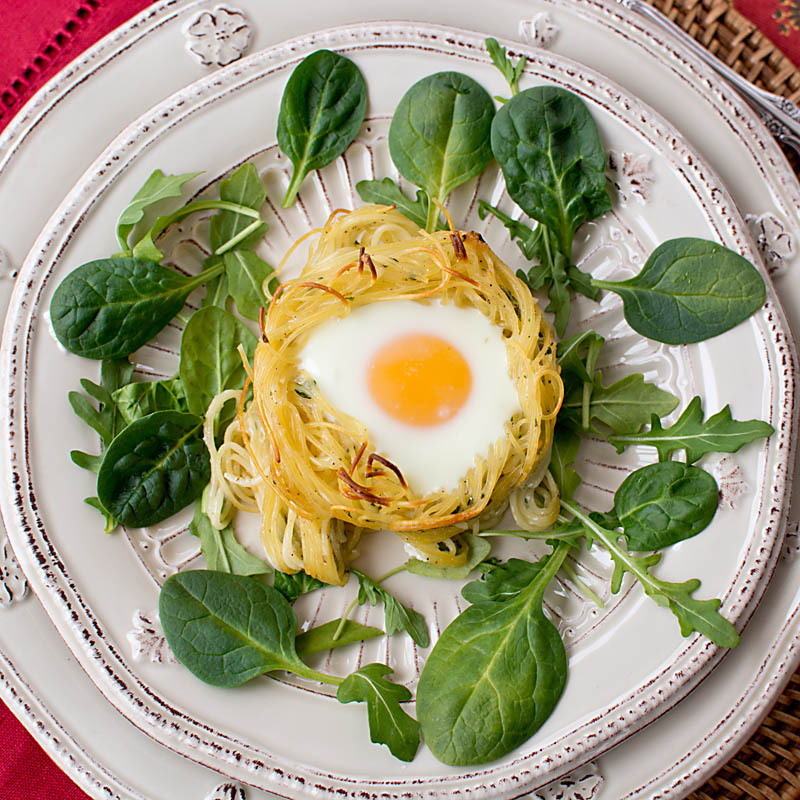 What a fabulous egg recipe and wow, what a gorgeous presentation!!!! A keeper for sure! You are very kind ;) Thank you, Roz! Susan this recipe look beautiful and delicious !! I love eggs !!! and love yours pictures!! Just delicious! You have me drooling, too, Susan. I'm lucky that I have a steady source of both chicken eggs and duck eggs. If I'm ever in a pinch about what to fix for dinner, I know there's always a frittata to make. But now you've inspired me to do something different! You are so fortunate to have those fresh eggs available to you! Thank you, Rosemary! 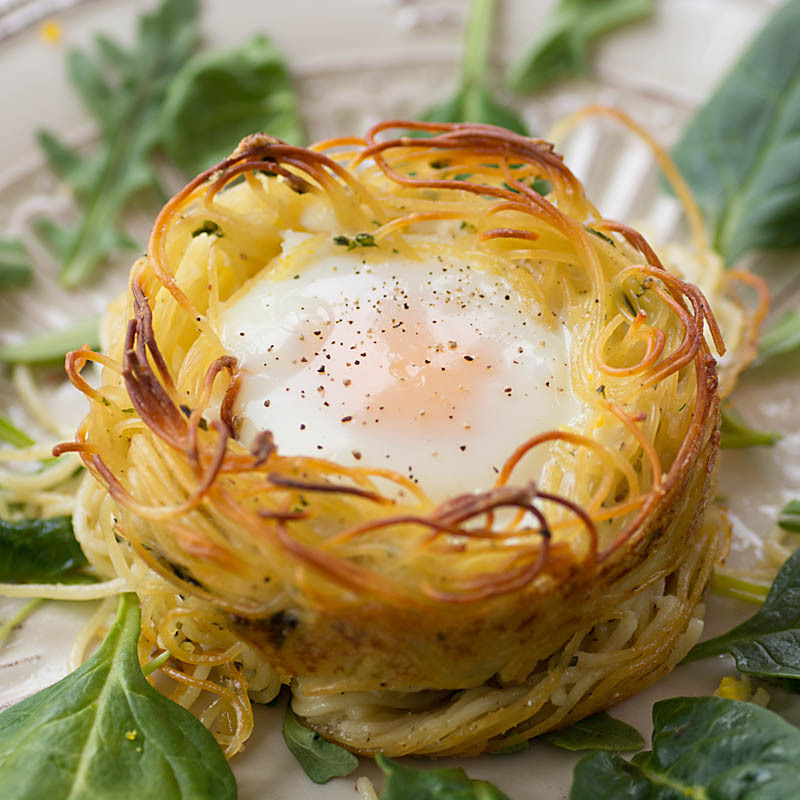 Oh how I love your pretty little egg nests…they are perfect for a special meal. Congratulations on the birth of your new grandson Bo, he is so cute. Beautiful! What a lovely idea for brunch! Hope the new little one is doing well. Cute and mouth-watering egg nests! My family would love this! A delicious idea for a fun meal! I loved the idea when I saw it too ;) Thank you, Joyce! Very beautiful presentation, Susan. This would make a wonderful brunch entree. It would! I think you could even prepare the nests in advance. Thank you, Pat! This is such a brilliant idea! I'm going to get more eggs to make this dish, this looks so delicious! What beautiful nests! Please tell me that you are making these for Easter! They would be perfect! Oh my goodness this is gorgeous! You are so creative - it is a lovely meal in a cute little nest. Amazing! 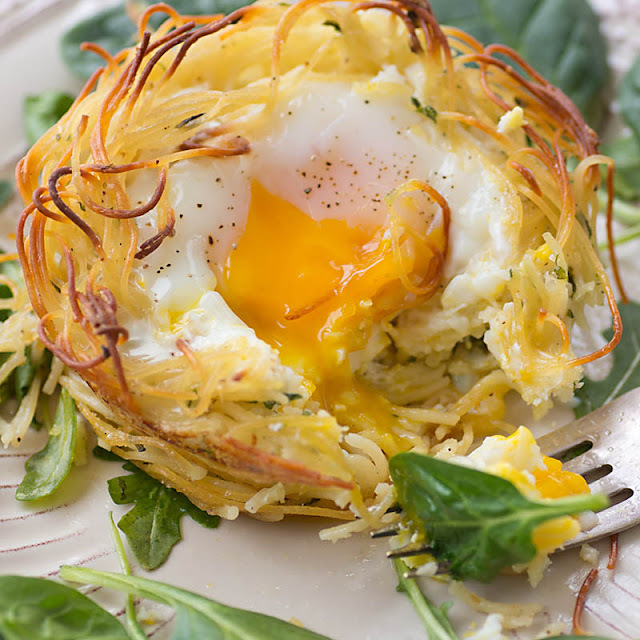 These nests are perfect for brunch Susan! they combine breakfast and lunch which are the very essence of brunch! Simply delicious! Susan these are beautiful and perfect for breakfast, brunch, or lunch. Also they'd be fun to serve on Easter. Picture perfect! I adore this idea Susan. Pinned to make soon. And like I say every time I comment. Your photos are fab. We enjoyed this recipe. Thought I might add some onion powder and garlic powder next time for a little flavor.